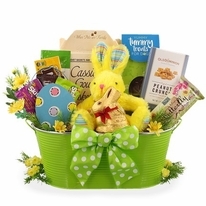 SAME DAY SHIPPING � Select any UPS Shipping method and place order before Noon MT Monday - Friday will be shipped same day. Orders placed after Noon MT, or on weekends and holidays will ship the next business day. Buy A Bone Help Give a Dog a Home Peanut Butter Bone 2.5 oz. 5% of proceeds are donated to organizations that help animals in need! Cassidy's Gourmet Biscuit Mix 14 oz. Good Dog All Natural Treats 8 oz. Peanut Butter Dog House Treats 4 oz. 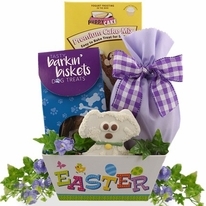 Being Leader of the Pack can be for real this Easter with this fabulous doggy Easter basket. 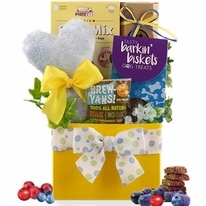 One thing will be for sure, you will hear the neighborhood dogs all howl with jealousy when they see this Easter delivery of special doggy treats. Packed solid, this classy faux leather container holds an ample supply of biscuits in a variety of flavors. 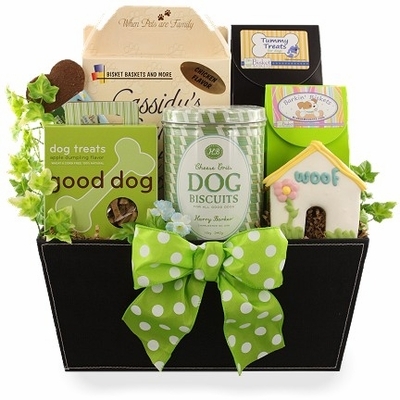 We�ve also included the very doggie delicious Cassidy�s Gourmet Bisket Mix for baking up those easy to bake doggy biscuits from right there at home. Your special message can be handwritten on an upgraded Easter gift card to add a personal element to your gift. The Custom Handmade Easter Cards are unique and no two are the same. The card itself can be a keepsake of your thoughtfulness.